It's been a crazy couple of weeks with a lot of activity geared toward writing. First and foremost, I suppose, was that last week I got to interview Ginger Baker by phone. He's coming to town for the Pittsburgh JazzLive Festival in mid-June, so if there was any chance of talking to him, I was going to take it. I guess the universe called my bluff. It came together quickly too. I had been thinking about it, and when I emailed the JazzLive organizer, I got an email hours later from Ginger's English publicist trying to figure out a time for an interview. We settled on a Friday morning at 7 a.m. EST (in England, that's noon). Fine with me because my work schedule prevents me from doing interviews during normal business hours. I'm typically up at that time anyway. The Love Letters had a show the night before, but no problem. I was up at 6:30 putting questions together, and kind of panicking. One thing: I WASN'T going to ask him - Cream questions. I really believe that one of the reasons Ginger is such a rough interview is that people ask him freeze-dried, dumb questions. Plus, these people never seem to have taken Journalism 101, wherein it is taught that you don't ask Yes/No questions if you want your subject to open up. I went to pains to phrase questions with "How" and "Why" at the start. On top of all that, he's coming here with a jazz group. He's not coming to play some permutation of Cream music. At 7, I dialed up the number and heard that unique British ring. Then I heard a voicemail. With a woman's voice on it. Did I dial the right number? Am I being stood up? I waited five minutes and called back. Same thing. Quick - email the publicist. A few exchanges and we're rescheduled for 9 a.m. This time he does pick up. His voice is low, a bit gruff. At this point I should mention the big thing the publicist mentioned that really had me worried about the call: Ginger is hard of hearing. Like many 70+-year old men, he also had the tv going in the background. But it went.... smoothly. He didn't yell at me. He spoke. Not a whole lot. He even mentioned towards the end, with a chuckle, that he's not much of a conversationalist. "I just play," was repeated a lot too. I haven't transcribed the interview yet, but I'll need to get on that soon. Then I'll see how much I really have to work with. After that call, I felt like I could climb Mt. Everest. But that was shot down a few days later. While I was trying to get the Ginger interview set up, I also needed to land an interview with somebody in Wire, who are also coming to town. It finally came together on a Sunday night at 9 pm. I know their first three albums really well and I received a copy of their most recent album, Wire, which is pretty good. I'm set, right? Not exactly. Ten minutes into the conversation, what started out with some career-spanning, over-arching questions had narrowed down into a talk just about the old days. Then Colin Newman asked if I only knew the '70s Wire albums. The real answer is that's what I know best. Working knowledge of their '80s ones, plus a few spins on the new one. I wasn't trying to sound like one of the "boring" people that, as Newman mentioned, dismiss everything but Pink Flag. Hell, I was surprised that the band even revisits that stuff, or talks about it at all. I thought they didn't look back. But he told me I was the first interviewer on this tour that only really knew the early stuff. He doesn't mind talking about it, but he doesn't want someone to read the article and think they're going to just hear greatest hits. Apparently there are a lot of books about it to use as reference. Though, as a reporter, who's going to quote from a book when you have the real thing? By the end, we were on good terms, though. He spoke at length about the Drill Festival that they've done in various cities, including one coming up in Chicago on this tour. It was unfortunate that I only had 500 words to devote to the article, so the scope was narrowed. They're here next Sunday and I'm looking forward to it. Stay tuned for a link to it. While I'm here, I might as well link the article about David Torn - who's playing Club Cafe tonight - and William Parker, who played this past Thursday at the Thunderbird. Click here. Myra Melford took inspiration from the Persian poet Rumi in her previous quintet, Be Bread, using the words and subject matter to shape the music. Snowy Egret, made with an entirely different band, draws on another literary source, that of Uruguayan author Eduardo Galeano and his Memory of Fire trilogy, which tells a history of the Americas through indigenous myths. Galeano's way of writing was idiosyncratic - with some chapters being only a paragraph long - was as much an inspiration as the text itself. 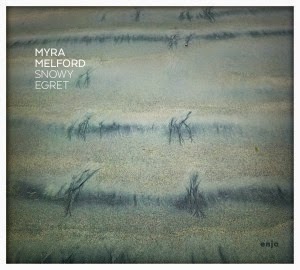 As a result, pianist Melford has come up with another set of highly unique, intriguing material that rewards repeated listens. Snowy Egret draws on melodic ideas that aren't merely sourced from jazz (free or grounded) nor do they attempt to fuse jazz with music that might be connected to Galeano's writing. Although the references to both of these elements can be felt in the pianist's writing, Ron Miles (cornet), Liberty Ellman (guitar), Stomu Takeishi (bass) and Tyshawn Sorey (drums) are equally responsible for what happens in the music. At times the structure is more minimal, like "Language" which is built largely on one suspended chord. The piano, guitar, bass and cornet play it together, sounding like an even more angular version of Monk's "Thelonious" riff, before switching to a B section that still involves parallel movement. Variations on the structure come during solos by Ellman and an especially warm passage by Miles. "The Kitchen," by contrast goes through various permutations. After Sorey (one of the most melodic and rhythmically inventive drummers around) unleashes a tidal wave of tom thunder and snare rolls, the quintet plays a brief stop-start melody, interrupted by free statements by Miles and Ellman. They finally lock in on an off-centered bluesy vamp that allows Melford to pound chords and fire off rapid melody lines, pushing the group away from structure until the finally return home to the staccato theme. Free excursions also happen in "Little Pockets/Everybody Pays Taxes," in which Takeishi holds things together while everyone around him goes wild. But Melford also writes with sensitive lyricism: "Times of Sleep and Fate" follows "The Kitchen" with a rubato melody brought to life by guitar, piano and muted cornet. "The Virgin of Guadalupe" also begins as a gently as a ballad, with the rhythm section gradually rising in the background behind Miles. The opening bars of album closer "The Strawberry" has gospel voicings in the piano, though it doesn't sound like Melford is trying to take us to church, as it switches to something a little more Latin based after less than 60 seconds. Writing about Melford's albums tends to be a challenge. They often have so much happening that the risk is wanting to dissect every song or to try to offer a simple overview of the album. The latter never seems to get the ideas out directly. Suffice to say, mere words can't describe the depth of Snowy Egret. Find it and use your own ears make the decision. Lina Allemano came to town about a year and a half ago, playing one of the Space Exchange shows, the Tuesday night jazz/experimental/what-not night that's normally hosted by a few different local musicians at the Thunderbird Cafe. At the time, she was with her quartet (trumpet, sax, bass, drums), who played it straight but solid. Last week, her return was a little different. Known as Lina Allemano's Titanium Riot, the group includes drummer Nick Fraser (who was also in the quartet), bass guitarist Rob Clutton and keyboardist Ryan Driver. The group was free all the way (so was the admission charge, so if you missed it, shame on ya). Allemano was blowing rapid clusters of lines, never really digressing into guttural smears or high splats, but definitely locking into flurries of notes. Fraser was a study in restraint, rarely looking at his kit straight on. He seemed to have his eyes closed most of the time, with an expression that meant he was listening attentively to where the music was going. Clutton was sometimes hard to hear, plunking on a classic Fender but often getting lost in a wave of sounds from Allemano and Driver. The latter was the wild card of the night. He was playing a Realistic keyboard. Yes, Realistic as in the kind that Radio Shack used to sell. I can recall noodling around on one of those (and getting yelled at) in a Radio Shack about 35 years ago. It might not be the same exact model, because Driver seemed to be hitting more than one note at a time, while I think my version was monophonic. But he was doing a lot of knob twisting too. For the second set, saxophonist Ben Opie (who helped bring Allemano back) sat in with the group. The addition added another level of excitement to the music. Things were still free but the conversation seemed to deepen a bit. If, by some chance, you're reading this entry because you googled Lina Allemano's Titanium Riot since they're coming to your town, be sure to check them out. And buy some CDs too. Their Kiss the Brain disc is really solid. Around this time 30 years ago, I was going through some sort of existential crisis (although I didn't know it at the time because I had no idea what that meant) because I was a senior in high school and not sure what I was doing once I graduated. At that same time, Pittsburgh newcomer Josh Arnson was teaming up with local underground music stalwarts Evan Knauer, Mike Marcinko and Steve Heineman, and formed a band they dubbed ATS. This was the age of initial bands: DRI, GBH, NSFU, TSOL; though none of those bands have anything to do with ATS' music. That was also the age of cow-punk which ATS was somewhat-incorrectly described as, at the time. Jazz, Minutemen-style punk, real country and anything else they were listening to - it all got thrown in to the blend at some point. The band marked their 30th anniversary this past Saturday, by playing a characteristically loooooooooong set at Howler's. Arnson and Heineman, if you don't know, left the band 25-28 years ago. Kip Ruefle replaced Heineman, and once guitarist Arnson left, they soldiered on as a trio, save for the occasional auxiliary horn player or extra guitarist that just showed up. The core ATS trio of Knauer, Marcinko and Ruefle was expanded with Heineman on keys (that guy can play anything and do it well), saxophonist Tim Pollock and trumpeter Downtown Steve Brown. The joke about ATS' early days is that all of the sets were the same. You could set your watch to the cymbal introduction to "Helsinki Town" as the evening got started, never letting up until "Song for Alice" at the end. A lot has changed in 30 years. The first two-thirds of the set were new songs, relatively speaking. Knauer even made some quips about "new" meaning they were written in the past six years. Time has done nothing to slow these guys down in terms of songwriting or performance. In fact the noodling that was part and parcel of some of those early shows has really been streamlined in recent years. And by the time they got around to riff-based "classics" like "Sepco and "Louise" at the end of the set, I was kind of craving them. Prior to that, the newer ones sounded as strong as the oldies. Of course, by the end, I was nearly falling asleep on my feet. I stayed until the end, but it was trying, after that third drink.